For nearly five years, XPin has been the collector community’s choice for re-engineered replacement displays. With a strict adherence to quality control and an eye for innovative design, Brett Davis has engineered a bevy of replacement parts for our beloved games. 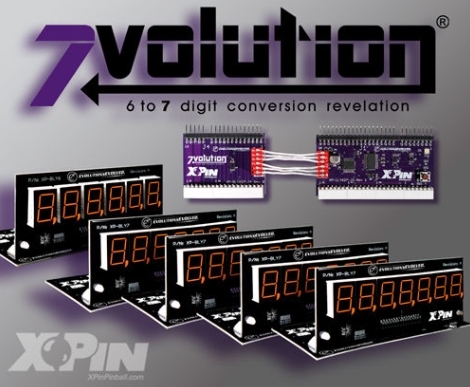 With his newest innovation, 7Volution, he has also changed the way we play our games as well. Credit Dot Pinball is pleased to present an interview Mr. Davis about his beginnings, innovations, business philosophies and new products. Credit Dot: How long has Xpin been in the pinball business? Brett Davis: The XPin brand has been in existence since September of 2011, which is when the first distributors started to receive their product. The actual http://www.xpinpinball.com website when live in January 2012. CD: What were some of the first Xpin displays offered for sale? BD: That’s a tough one. Because of the product line, it only makes sense to offer all similar products at once, so it would be all of my Williams and Bally displays. They were all released about the same time. The Dot Matrix displays were released a little bit later. CD: Is there a history between Xpin and Pinscore? There is some overlap in the products offered. BD: There is some is some history between XPin and Pinscore. I am the original designer of the Pinscore products. When I chose to separate myself from Pinscore, the original Pinscore designs became the property of Marco Specialties because they owned the name Pinscore. This forced me to re-engineer what I had done to make XPin. XPin’s XP-WMS10877 display kit, in blue, installed in the author’s Pin*Bot. CD: What makes the XPin product a better choice for aftermarket displays as opposed to those of your competitors? BD: There are a couple of reasons that XPin is a better choice for aftermarket replacements. First, each product is a true re-engineering, or re-design of the original product. I did a lot of research into the failings that occurred with the original designs. I guess you can say it was a little forensic engineering. I chose to avoid copying the original design because in doing so you just duplicate the problems that caused them to fail in the first place. Second, technology today is so much more capable than it was 20-30 years ago. The majority of failures that occur due to the circuit design can be eliminated with newer technology and different circuits. Third, using modern manufacturing methods, reliability and cost can be controlled to make a quality product. Obviously with exceptions to components and the circuit boards, all XPin products are manufactured here in the US. CD: Can you share some of your best selling display kits at the moment? BD: The XPin bestsellers are the Williams System 11 displays and the XP-DMD4096 (dot matrix) displays. CD: Can you tell me a little about your groundbreaking 7Volution display kit? BD: Modern technology is what makes 7Volution possible. Over the years people have hacked the game code, modified the MPU boards, added wires to the harness, all to make 7-digit scoring possible. The problem is that once you choose to go down that mod path, it’s hard to go back. Also, if you are not an experienced tech, making the mod is fairly daunting. 7Volution’s prime goal was to be a plug and play solution: no mods, no cut traces, no rom changes needed. The heart of 7volution plugs into the MPU and watches the display data. When it sees that the score boundary has been crossed, it jumps in and takes control and displays the new score…and then keeps track of it. If it wasn’t for the processing power of new technology, 7Volution wouldn’t be possible. Pinside user bcrage88’s Paragon with 7Volution display kit installed. Vinyl filters were used to achieve the three colour effect. CD: Where did the idea for integrating a seventh digit originate? CD: I find it really cool that Xpin customers can customize the look of their game by choosing the colour of their displays. Generally speaking, does one colour outsell the others? BD: Surprisingly Orange is still the preferred color, at a rate of about two to one! CD: I noticed a slight price difference between some of the colour choices, with blue being more expensive than the red and stock orange. Why is this? BD: It is all about chemistry. To manufacture blue or white, a different set of elements are required to get to those colors. Elements for red, orange, and green are more readily available. The elements used to create Blue and White generally cost two to three times more than the other colors, so they end up costing a few more dollars. CD: Are all of your display products plug and play? BD: Yes, everything is plug and play…with a caveat. WPC games with dot matrix displays have an exception when it comes to the colors Blue and White. There is an original design flaw in the dot matrix controllers. Blue and White draw more current because the blue and white LED requires more current (it is that chemistry and element thing mentioned previously). Realizing this I developed plug-in modules, my X-Bridge XP-WPC-HV and XP-WPC95-HV. These boards compensate for the original board shortcomings. 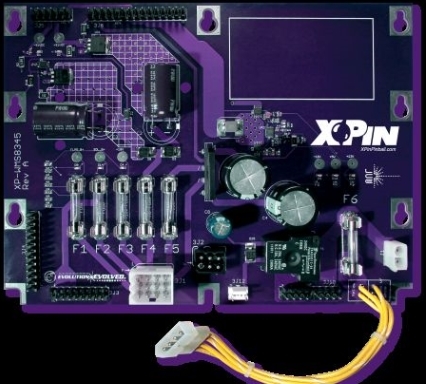 XPin’s versatile XP-WMS8345, that will replace the power supply in a staggering 51 different pinball games! CD: Xpin is known for their replacement displays, but you carry a lot of other replacement boards as well. What is your best selling product in that area? BD: The power supply arena is a big one. My universal Williams power supply, XP-WMS8345, is my most popular. It can be installed in every Williams Sys 3-11b that used either the Williams part number C-7999 or D-8345. It also will work in all of the Data East games that used alpha numeric displays. That is 51 different titles serviced by one board! CD: What do you do to ensure your customers are receiving the best possible replacement parts for their games? BD: Component selection is always a key in any redesign effort, along with an understanding as to what is expected by the end-user. This of course is a major part of the product development, but the manufacturing of the product is just as important to maintain quality control. Every product has a test fixture that is used–the fixture will test as much of the product as possible. For example, the XPin dot matrix display has over 300 components on it. Look at each individual trace on the board– if you laid them end to end, you would have about 300 feet of copper trace. Over 2,000 holes are drilled into that board. When you have that much happening, you do not skimp on testing. Most boards go through at least 2 minutes of functional testing before they are released from production for packaging. Every few months I do a random sample and put them on a test fixture for a couple of days. There are a lot of great engineers capable of doing what I have done from the design side, but managing the production side is a whole different ball game, and if you have that down, you will end up with a great product. Pinside moderator gweempose’s Tron with a blue XPin DMD display installed. Absolutely stunning! CD: When developing new products, be it a board or a display, what are some of the factors that are considered? BD: Considerations for any product development come from my customers. I give all suggestions consideration. Some are actually quite doable, but then it comes down to how much will it cost to execute. In turn, you also have to consider reasonable expectations for a retail price. Also, when considering a new project, I look at how many games will it go into. Take for example Williams’ Banzai Run. That game’s display is completely unique. It was never used in another game, but I still made it. Why? BR is a very collectable game. I currently use the driver board in my XP-WMS10877 system. I just needed the big board and connection mechanism. I look at all of the designs this way. CD: Are there any memorable design challenges that Xpin has overcome in updating PCB technology over the years? 1. Make it consume less power than the original design. This is a very important requirement because these products oftentimes are going into old, tired machines where the electronics may not be up to original specs. 2. Make it plug ’n’ play. Most of my customers tend not to be do-it-yourself hobbyists or knowledgeable about electronics. They usually can disconnect a few cables, take out screws and then replace them all with a new board. If they have to do much more than that then they will, more than likely, need to call a tech for help. 3. Make it as bullet-proof as I can. More times than not, someone is replacing an original board with an XPin product because something caused the original board to fail. If the time wasn’t taken to find the original failure, then the likelihood of continued failure is high, even after a board change. 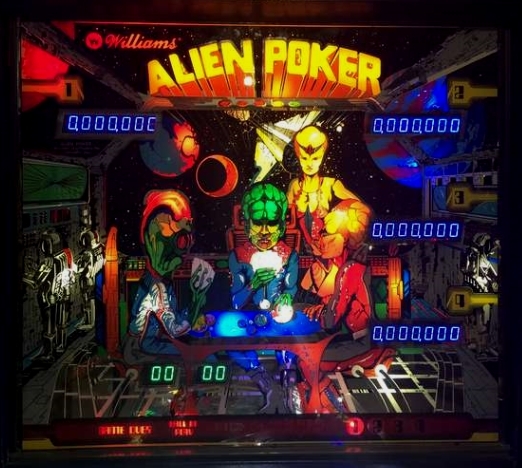 Pinside user Stretch7’s Alien Poker with Xpin’s XP-WMS8363 kit installed. 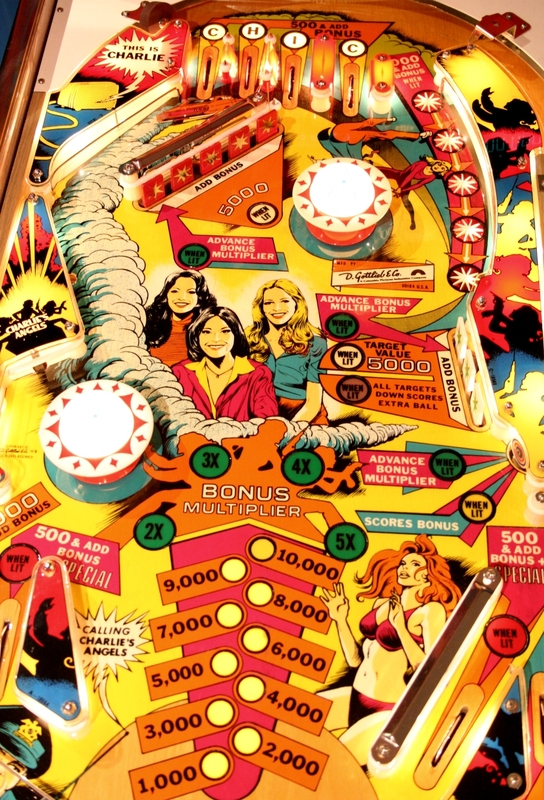 CD: What are some of the improvements that Xpin has made over the original designs by the big names in pinball? BD: In the displays you see some of the best improvements. Brightness control for display brightness, test buttons to illuminate all segments/dots. Along with this is the low power aspect. Lower power means less heat released by the older power supplies. 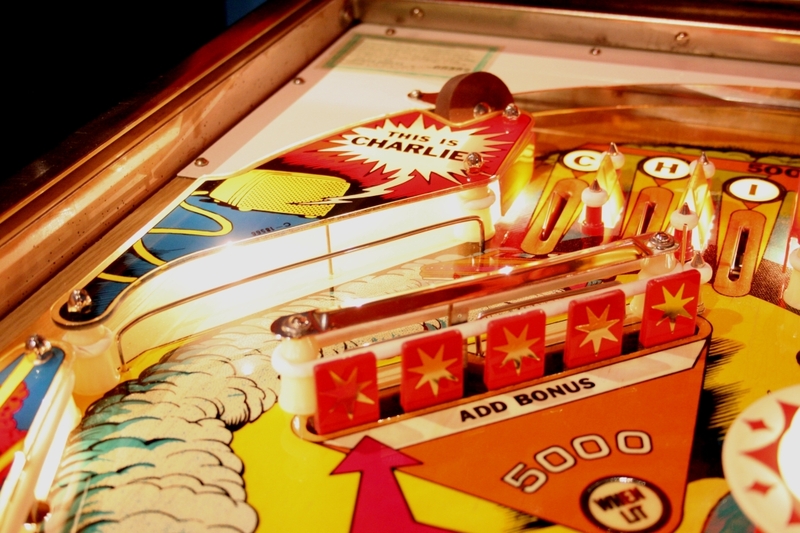 CD: How active is Xpin in the pinball community? BD: I like to think I am very active. I frequent Pinside quite often. I sponsor tournaments when I can, such as the Retro Tournament at the Texas Pinball Festival. They will actually have two classic Bally games that will be running my 7Volution Systems this year. I am also scheduled to sit on the Pinball Developers Panel that will be at the Northwest Pinball and Arcade Show later this year. All of it very exciting! 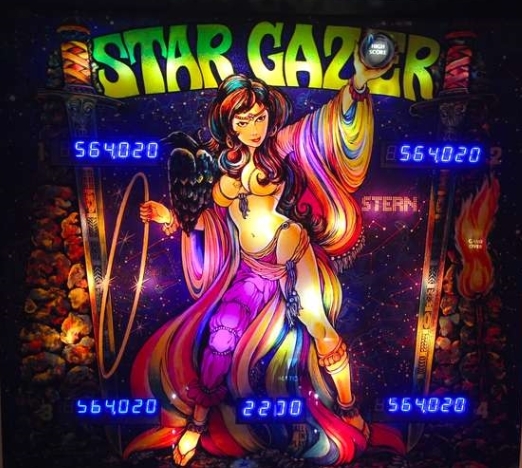 CD: In talking with customers, have you found that they are primarily buying new displays to replace inoperable ones or buying to just give their pinball a fresh look? BD: Most of my customers make the choice because of a failure or an obvious pending failure. Very few seem to be replacing the existing functional boards with my products just because it’s new. Pinside user PappyBoyington’s Stargazer looking phenomenal with XPin on board! CD: Can you give the readers a preview as to some of the products Xpin will be releasing in the near future? BD: Let’s see…I have begun work on the Williams Sys3-6 7volution system. There is a lot of excitement there. I am also working on Gottlieb and Zacaria display sets. I have a few more items coming out but I waiting to announce those at Texas Pinball Festival. 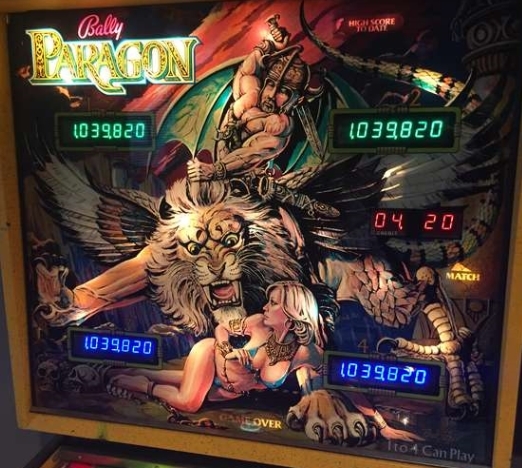 CD: What are some thoughts about this new pinball “resurgence” we are all a part of? Do Xpin sales reflect the increased interest in the hobby? BD: I think this is AWESOME! I love talking to these innovators. XPin is standing behind them 100%. Spooky Pinball currently uses a green XPin for its America’s Most Haunted and I will be there for their next title, too. 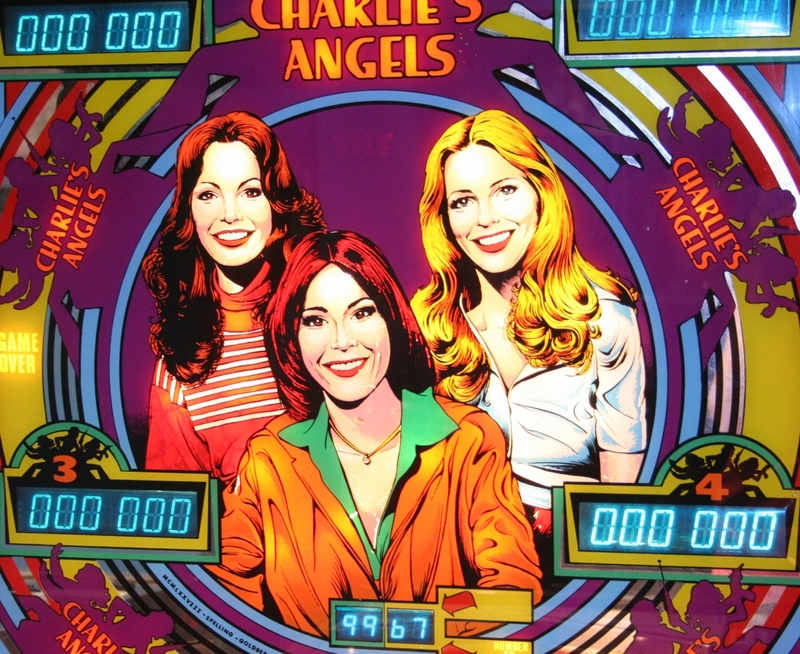 I have also done preliminary work with other boutique pinball groups and I can only wish them well. I have a lot to offer to them with my ability and manufacturing contacts so in the long run I hope to become a partner in their success. An XPin DMD display in green, appearing in an America’s Most Haunted near you! 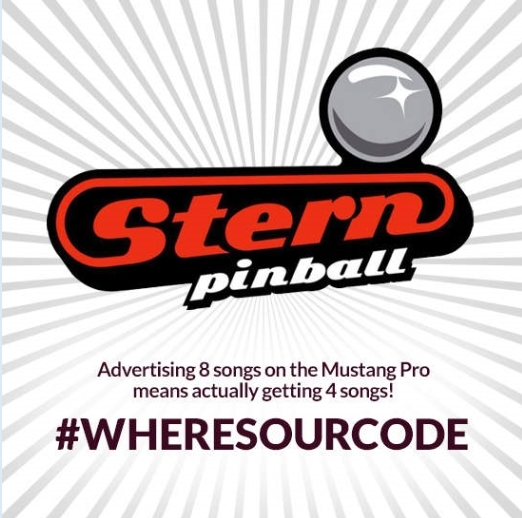 CD: What games are currently in Xpin’s pinball lineup? What are some of your all-time favourite games? BD: At the moment I only have 3 games: Mars God of War, Cyclone, and Silverball Mania. I under some space constraints at the moment, but I have my own list of wants. I just have to convince my wife of the “business need” to purchase them. 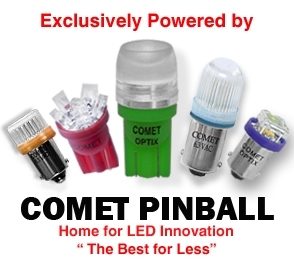 CD: Do you have any closing comments for readers in the pinball community? BD: You will not find a greater bunch than this group. I see this on the forums and when I meet them at the shows. I am very privileged to be part of such a great hobby and be able to provide something back to this hobby. Let’s keep on flipping! Mr. Davis can be reached at tech@xpinpinball.com, or you can visit XPin on the web. Products can be ordered directly from the XPin website, or through one of XPin’s fine partners, such as K’s Arcade or Bay Area Amusements. 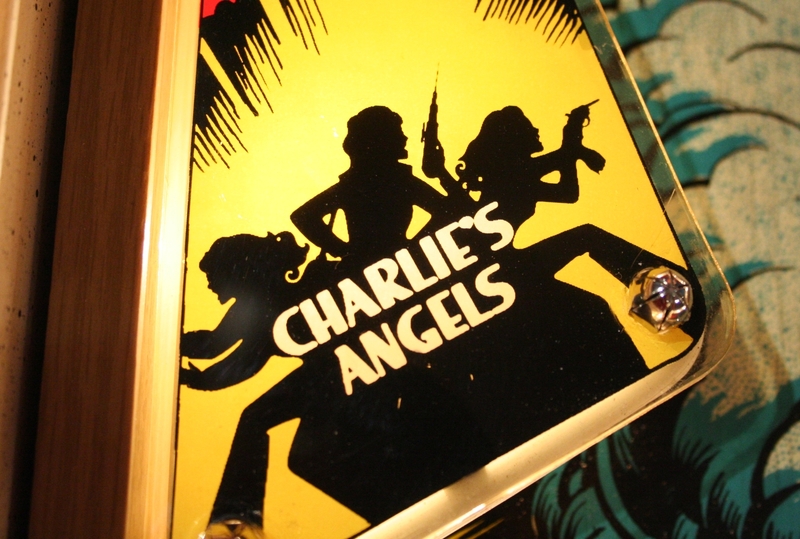 Look for Mr. Davis and XPin at this year’s Texas Pinball Festival March 27-29, 2015 and at the Northwest Pinball and Arcade Show June 5-7, 2015. 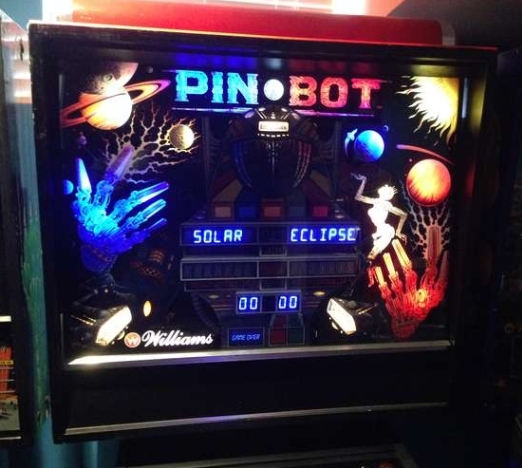 Categories: People | Tags: 7Volution, DMD, Pin*Bot, Pinball, Replacement Displays, Six Million Dollar Man, Stargazer, XPin | Permalink. 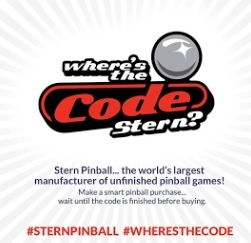 The story of Stern Pinball Inc. shipping their games with incomplete code has become a generally accepted practice in our hobby. Nobody is surprised when a new Stern game hits the streets with an incomplete set of modes, not much to shoot for, and “random” awards giving out the same point value over and over and over again. The practice is so accepted, it has become a tolerable joke: for example, “I’ll sell you my restored Fathom when Stern releases a game with complete code!” A recent movement on Pinside asked collectors to take a pledge: resist buying New-In-Box Stern games until code is complete, in hopes of sending a message to the company by hurting their bottom line. It worked to a certain extent. In a totally non-scientific study, just from reading Pinside, there has been a lot more “I like the theme but I’m not buying ‘til I see code” talk than there was in years prior. 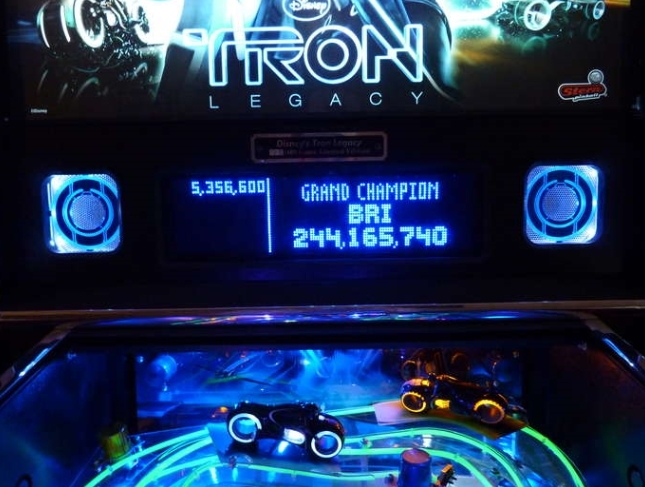 Pinside user “Flashinstinct” of Ottawa, Ontario, Canada took it a step further, planting the hashtag “#wheresthecode” into the pinball collectors’ lexicon, hoping to promote change and accountability. I don’t hold a particular hatred for Stern as I wait until the code is polished before buying there games but I’ll jump on board with everyone to make Stern a bit more accountable. If everyone that is pissed off is willing to get banned from Stern’s facebook page for a while I encourage you to do this and get it over with. This will keep the folks at Stern busy for a while and it will get the message across. In turn, this will reduce the amount of bitching, whining and hatred on this forum and will clear space for more productive posts. An early meme from the campaign. Facebook was the main target to get the code complaints out to the public. It was known from the start that Stern’s social media team would simply delete posts and ban users that raised questions and concerns that ran contrary to the image they wanted to portray on their page. Heck, if you haven’t been banned from Stern’s Facebook page at least once for sarcastic or questioning posts, you can’t call yourself a real pinball collector (I got the ban hammer for the first time shortly before Credit Dot existed). “I added the positive memes because I didn’t want to make it solely about code problems, but also Stern’s code successes. 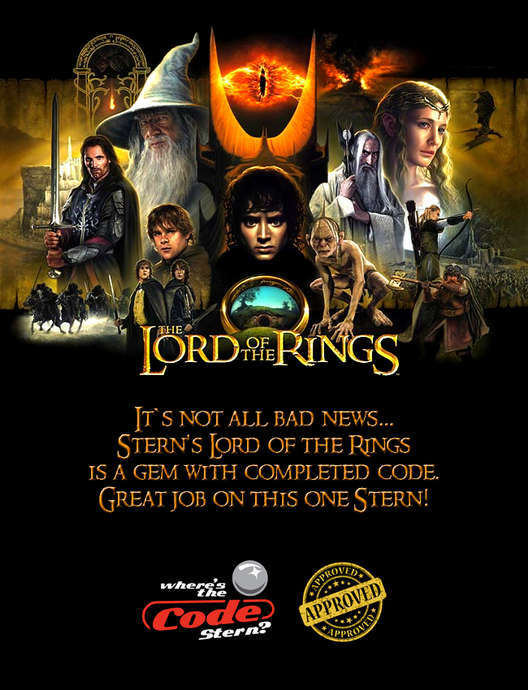 Obviously Stern as made phenomenal games…Tron, Lord of the Rings, Iron Man, to name a few. You have to look at both sides of the coin. I’m not sure I would agree with this project doing more harm than good. It is being rolled out in a far more respectful manner than much of the other static about code on Pinside. Any Stern customer, which, for the record I am not, has the right to kick up a fuss if they are dissatisfied, just as they should sing praise when they are satisfied. We have been assured that Stern has heard the masses loud and clear. But how do we know that? There has been little to no acknowledgement from the Stern camp to verify that change is coming. The “wait and see” approach doesn’t work: just ask an Avengers or Star Trek owner. 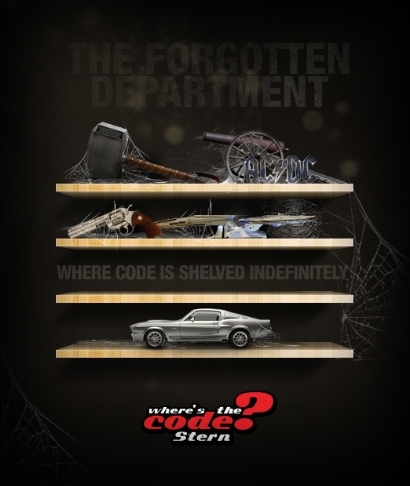 Regardless, the #wheresthecode logo has been changed to one that carries a generic, off-the-shelf font, and looks as if it is going to continue unfettered, if not a little gun shy. 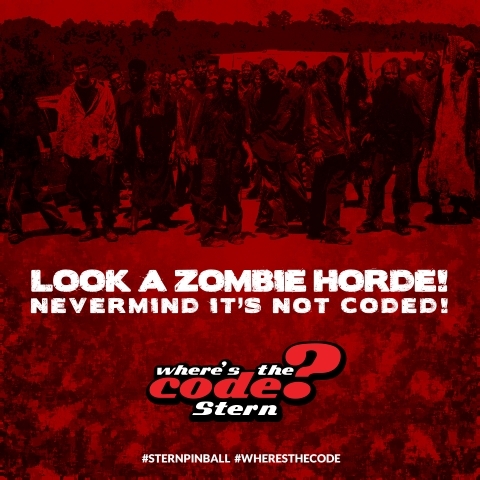 Categories: Feature | Tags: #wheresthecode, Avengers, Facebook, Gary Stern, Incomplete Code, Lord of the Rings, Pinside, Stern Pinball, The Walking Dead | Permalink.